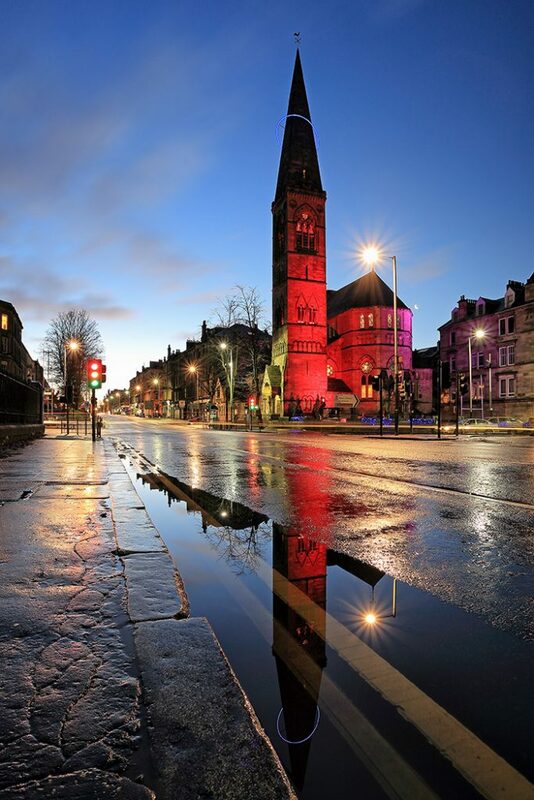 An early morning rise to capture the morning twilight glow of Oran Mor arts and entertainment venue on Byres Road, Glasgow. I was lucky enough to get the shot from Great Western Road with what looks like an empty street but in fact the traffic was coming in spurts and I just timed it right with the 25 second exposure before more traffic arrived. As you can see in the image there had been a lot of rain that night which left a puddle on the side of the road, I of course took advantage of that and got my Manfrotto 055XPROB tripod down at a low angle to capture the reflection. Having a Hoya low profile polarising filter on my Canon 17-40mm f4.0 L lens helped bring out the reflection nicely, too. You can also see the crescent Moon to the right of the Oran Mor building which was another bonus.